Hi Munchkin Blog readers! It’s @lunchesandlttles here, and can you believe it’s finally officially summer? 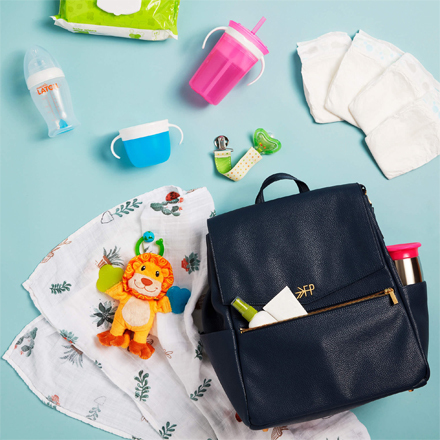 We are so excited for all that summer brings… Cookouts, swimming, frozen treats, later nights, family travels… And oh, did I mention – frozen treats? Ha. It’s true; we love delicious frozen treats around here; ice pops, ice cream, frozen yogurt, etc. 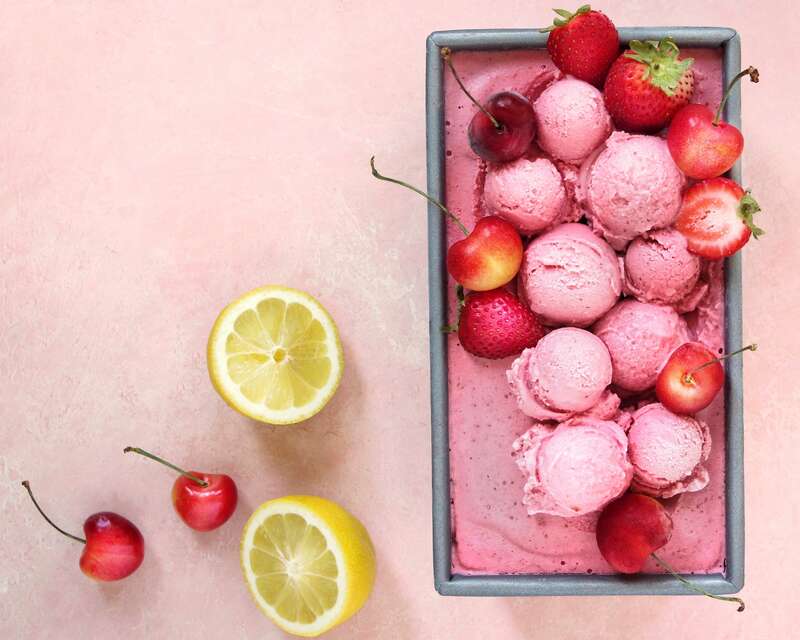 There really is no better way to cool off in the summer heat than with a few scoops of frozen yogurt or a popsicle, but have you seen the ingredients that make up some of these store-bought options? 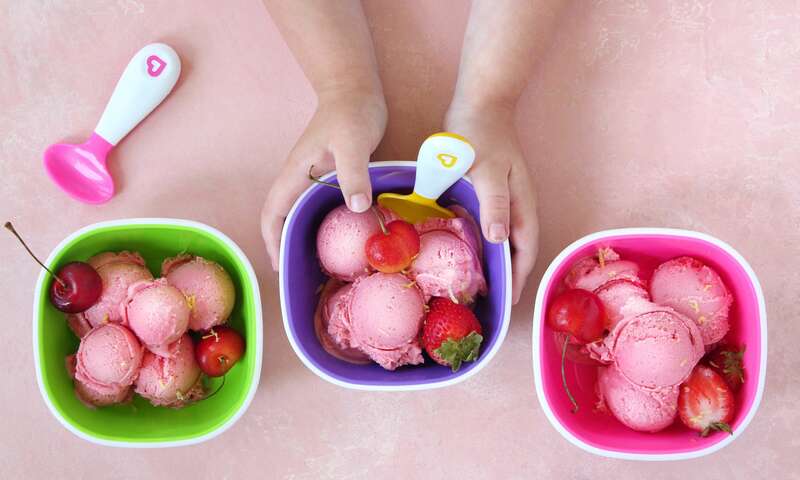 In popular brands of even frozen yogurt, which many assume is the healthiest option, you will often find more sugar than fruit, and ingredient lists that number twenty plus. And, of course – homemade is always an option, but I know that sometimes as parents we just don’t have the time to make complicated homemade variations. No worries. 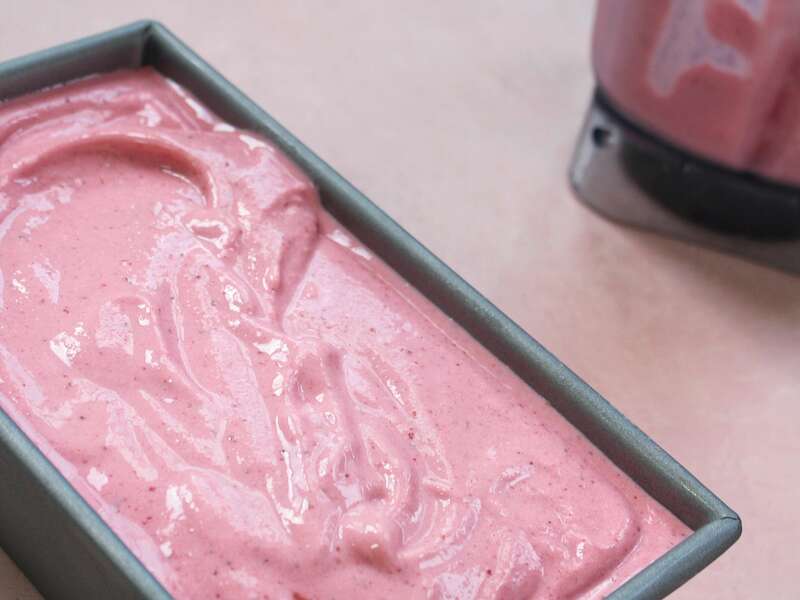 Today I’m excited to be sharing a super easy frozen yogurt recipe that comes together with just five ingredients… Yes, you read that right – five! And it is so easy, you can do it all in just a couple minutes. 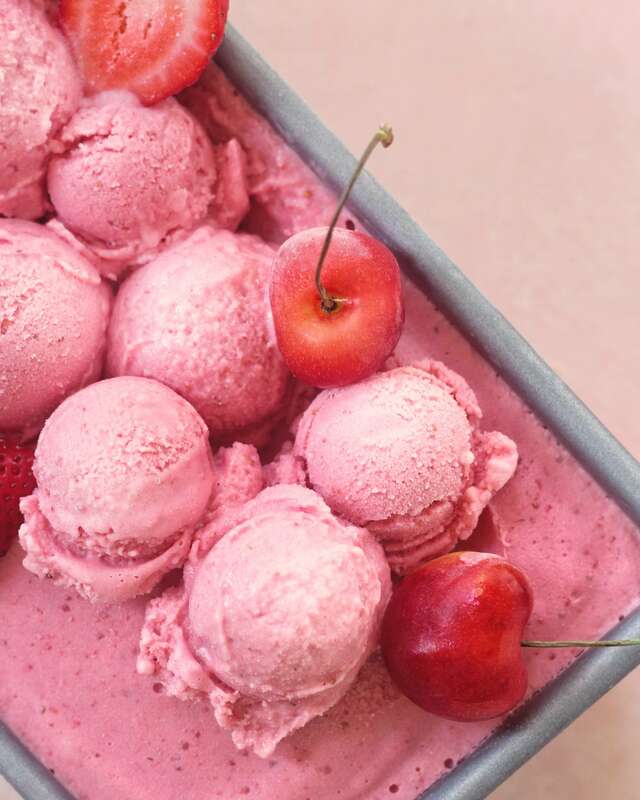 This Cherry Berry Frozen Yogurt combines Greek yogurt, strawberries, cherries, honey and a splash of fresh squeezed lemon juice – And, that’s it! Just a few simple ingredients, and it is all made using a high-powered blender or food processor. The perfect sweet and refreshing treat that is easy to make, made from minimal ingredients and is both kid and parent approved! Keep reading for the full recipe, and then gather up the ingredients and make it yourself! 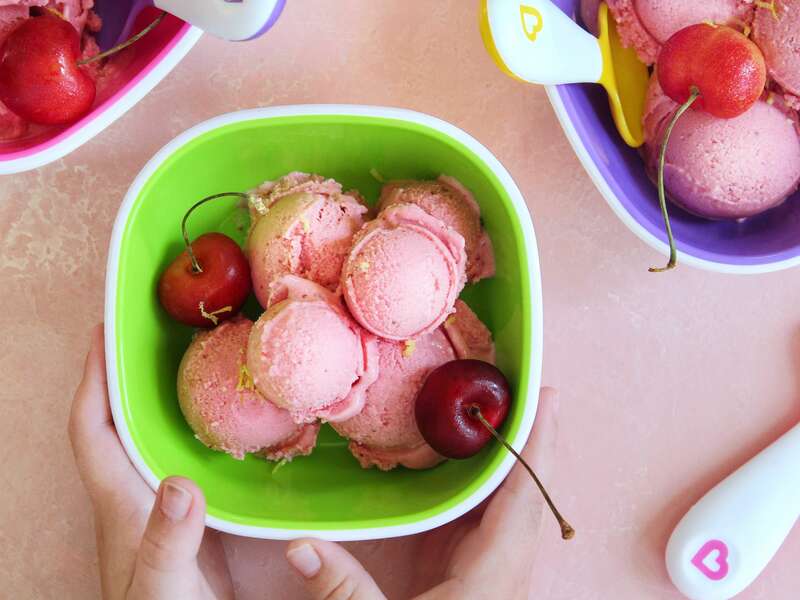 This frozen yogurt combines a whole lotta sweet and a bit of tart to bring you a delicious bowl of summer goodness. So fresh, so light – so easy! Be sure to tag #munchkininc and #lunchesandlittles in your posts if you do give it a try, because we want to see! And as always; before starting, be sure to read through the entire recipe below, to ensure best results! 3 tbsp honey *can use a different sweetener if desired: maple syrup, agave nectar, etc. 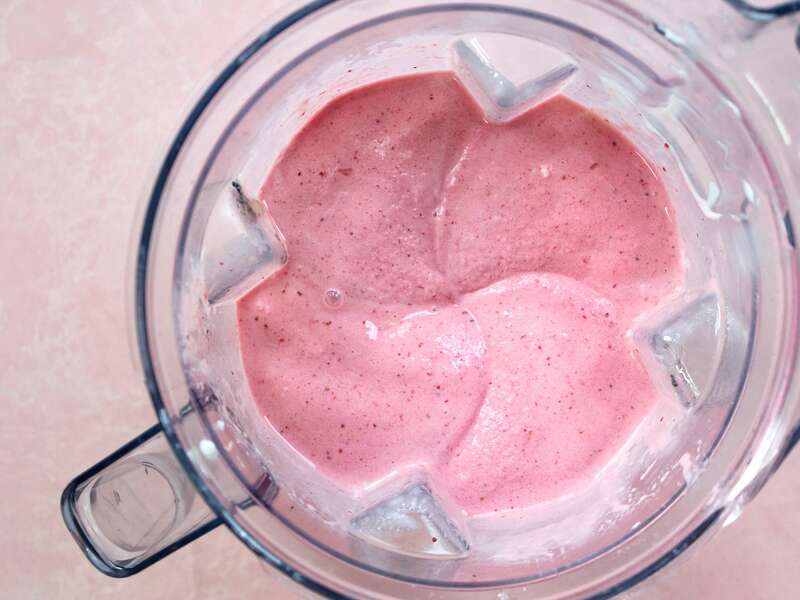 Place all of your ingredients into a high-powered blender (I use a Vitamix), yogurt first. You can also use a food processor if you do not have a high-powered blender. Blend/ pulse for 45- 60 seconds, ensuring all strawberries get blended into the mix until smooth. Once fully blended, transfer mixture to a freezer safe container and freeze for 2- 3 hours or until firm. If you like a softer variety (or your kids just don’t want to wait! ), you can serve immediately. Remove from freezer and serve up to your little ones (and yourself) and enjoy this refreshing treat all summer long. Garnish with lemon zest, if desired and serve with additional cherries and strawberries, if desired. Yum! Yum!! To keep this treat dairy-free, simply use a dairy-free yogurt. For dairy-free/vegan: use dairy free yogurt and substitute your honey with a different sweetener as desired. For more quick and easy kid-friendly recipes be sure to check out my feed, @lunchesandlittles where I am making meals and snacks like this all of the time. 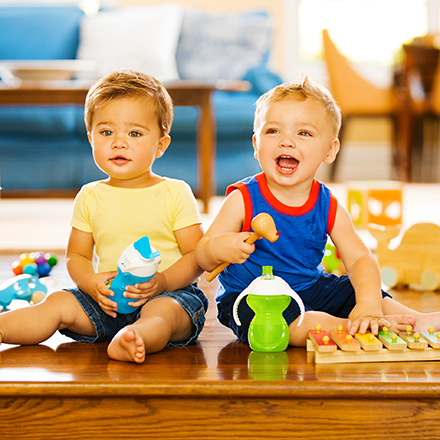 And check out www.munchkin.com for feeding supplies and more for your little ones, like the bowls and spoons from their new Splash Collection shown above.